Dr. E.L. Kersten leans against a cubicle, looking down upon an employee in a green ringer tee who holds a headset in his hands. “Y’know,” the employee says, holding up a dilapidated earpiece, “they’re five years old now and they’re starting to get a little unstable.” Without a moment’s pause, Kersten fires back, “But they still work, right?” His employee looks up at him, hurt. Kersten looks directly at the camera, knitting his eyebrows and shaking his head in incredulity. The Despair, Inc. video podcast, titled “Addressing Employee Complaints,” continues in this vein, with Kersten eventually deciding to leave an outsourcing brochure in the call center to remind the employees that it could always be worse. 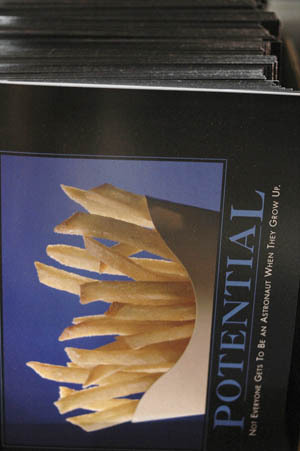 Despair, Inc. makes Demotivators, inspirational posters for the Irony Age. Take “Dreams”: Underneath a beautiful sunset over the mountains, complete with rainbow reflecting off a clear lake, the text reads, “Dreams are like rainbows. Only idiots chase them.” Or there’s the picture of skydivers reading, “Idiocy: Never underestimate the power of stupid people in large groups.” They also make the Pessimist Mug, which at its midpoint reads, “This glass is now half empty,” and Bittersweets, Valentine’s candy for the disenchanted. But Despair is about more than the products. There are, of course, the wickedly satirical video podcasts featuring Kersten as the company’s self-aggrandizing founder and COO. There are the order confirmations that warn the customer that “any pretense of consideration for your needs would be counter-productive to our raison d’etre” before attempting to sell them Kersten’s book The Art of Demotivation. There is the fact that you can order a hand-bound, letter-pressed “Chairman Edition” of said book with a personalized voice message from Kersten himself for $1,195. There is also the fact that it comes in a “Book Coffer,” which is also a fully functioning cigar humidor. And, oh, their fax number is 877-FAILURE. So when I walked into Despair’s office, I expected to find Dr. Kersten sipping apple brandy atop a mound of writhing white-collar stooges. What I found in reality was – well – not Despair at all. 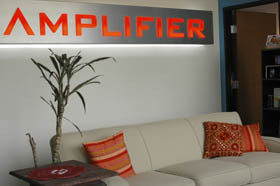 The warehouse’s waiting room informed me (in mammoth, glowing red-orange letters) that I was at the home of a company called Amplifier. Before I could ask what Amplifier was, someone told me that Walter Stokes, Despair’s CFO, would be out to meet me shortly, so I paused to look around the room: couches, a giant TV lined with Homestar Runner action figures, and Red vs. Blue DVDs. And then out came the least Despair Inc.-looking person I could have possibly conceived. 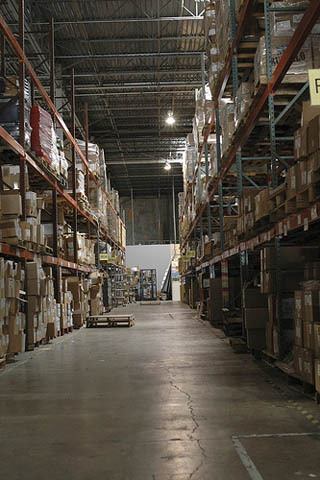 Walter Stokes, fresh-faced and wearing a maroon striped polo and cargo shorts, smiled at me and offered to give a tour of the warehouse. We passed through rows of boxes filled with t-shirts, prints, and even bottles of Stubb’s barbecue sauce. And just past a little station where people were sorting through a new shipment of t-shirts, there was the printing press room. Walter explained that they had bought the press so they could customize orders, like calendars with twelve prints of the customer’s choosing, starting with whichever month they ordered it. “We’re only leasing this press,” Walter said, “but you could probably trade this in for a big house in Hyde Park.” The hulking machine winked its red, incandescent eye at me. The press was an investment, of both money and time – Walter and some others had to attend a five-day course in Boston to learn how to operate it – and a second press was coming to handle orders for the Christmas rush. But as I was learning, heavy customization is crucial to Amplifier’s entire operation. So what is Amplifier, anyway? You may know them better by their clients: Besides Despair, there’s Penny Arcade, Rooster Teeth, JibJab, Ask a Ninja, and Tiki Bar TV. Amplifier is designed to facilitate business for the creative sector, whether that’s fulfillment, distribution, customer service, or anything else that might otherwise be outsourced. This lets small businesses do things like personalize orders, include bonus items for certain customers, tailor their phone support to the feel of their company, and be able to focus on ideas, not management. To show me how some of this works, Walter took me to the call center, where the audience reps work. Finally, I thought, I might get to see those rows of cubicles. But rather than the hive that Kersten wandered through in the video podcast, it’s a cozy room (Amplifier employs a total of only 19 people). Some of the reps sit on exercise balls instead of chairs. “It keeps me from falling asleep at work,” one of the reps admits. That was it. Walter says, “There’s an inevitable disappointment that sets in when people realize that Despair is not Despair, but really Amplifier.” So, then, what is Despair? Where are the cubicles? And where is Dr. E. L. Kersten? But that’s a bit misleading, so for the second answer, I met with Justin Sewell, one of Despair’s founders. He promised to set me straight on the Despair, Inc. myth: “We perpetuate it in our photography and catalogs,” he told me. “We try to convey this sense that we’re an empire.” In stark contrast to the fictional video podcasts, Despair itself has never employed more than four people – perhaps a good model for a company that rails against management culture daily. Despair: It’s always darkest before it goes pitch black. With the company in severe disarray, fortunes rose and fell nepotistically. Not even higher education mattered, and the brothers Sewell found themselves just as broke as their Doctor-in–Organizational Management co-worker, Larry Kersten. The three found inspiration in the world of their bizarre former employer; as corruption ran rampant around them, they still found catalogs for motivational products. That seemed entirely ludicrous, so they began to create parodies of those products that would soon become hits around the office. After calling in a Ph. D to help recover the data – which, after a few months, was successful – the company gave every employee, regardless of his or her job, a list of 800 or more customers to call in order to collect the lost money. The idea that his work could lead him to track down an old high-school friend to claim money is, to Justin, “rich and hilarious.” Not bad inspiration for a company fueled by satire. Risks: If you never try anything new, you might miss out on some of life’s greatest disappointments. Justin, Jef, and Larry Kersten jumped their former employer’s ship with $15,000 apiece (a fraction of the quarter-of-a-million they’d each been promised) to develop and market their new Demotivator products. “One of our biggest mistakes,” says Justin, “was thinking if we built a library of funny stuff and went to trade shows where all this motivational stuff was sold, people will just gobble this up.” But people’s reactions ran colder than expected: from ambivalent to hostile. Justin explains, “Even with the people who liked what we had, there was this feeling of, ‘I think this is funny, but I could never sell it in my store.’ And others were like, ‘Have you heard from Successories yet? Oh, you will.’” This left them demoralized, but more significantly it left them in debt, having spent about $50,000 for the mockups but generating only $6,000 in sales. Even worse, to get the discounted printing rates for their calendars, they’d have to print 10,000, costing hundreds of thousands. Their only choice was to go online to try for more sales. So they did, despite hearing four years’ worth of tanked e-commerce stories. And then something miraculous happened. It didn’t hurt that their co-founder, Larry Kersten, had his Ph. D in organizational management and could make the perfect face for Despair. “We wanted someone that would look entirely the part, and central casting could not come up with a better persona for Despair, Inc. That’s the incredible serendipity. He’s got the degree, he looks like a captain of industry, and when you put him on camera he’s got so much credibility because he’s an intellectual. He’s the kind of person who people are comfortable giving their money to,” he says with a laugh. Motivation: If a pretty poster and a cute saying are all it takes to motivate you, you probably have a very easy job. The kind robots will be doing soon. Though Successories refused to comment on Despair officially for several years and never took legal action against the parody products, Despair was getting a closer look at how the motivation industry responded to its presence. Justin recalls being contacted by a Successories employee who wanted to trade his employee calendar for a Despair calendar. The employee’s first email made them laugh, he remembers. “‘I am an employee of successories, and I know you probably don’t like us very much, and the environment in which we work is not exactly what you could call inspiring. The walls are beige, the light is beige, the air is beige.’ And he was just playing along, being funny, but it was a comment early to us from somebody in the trenches.” So Justin agreed to make the trade, on the condition that the Successories employees sent back pictures of the Despair calendars hanging up in the Successories office. And, of course, they did. Inspiration: Genius is one percent inspiration and 99 percent perspiration, which is why engineers sometimes smell really bad. “I’m not the author of everything,” admits Justin. 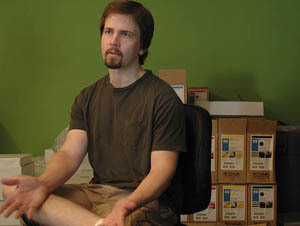 “I’ve written the majority of the products, but the inspiration for the original designs was abject annoyance for a motivational posters catalog.” Since Amplifier handles most of Despair’s auxiliary work, allowing Despair to be more of what Justin calls “a perfectly virtual brand, where all it is is a brand, and everything else is outsourced,” he can do most of his work from home. Much of that work is thinking up new ideas for products. Likewise, Kersten spends his time in Dallas – which explains why he wasn’t at the Austin headquarters – and does most of his work for the company through either telephone or e-mail. The two have thought up most of the products, marketing copy, and other creative aspects of the Despair experience. Teamwork: A few harmless flakes working together can unleash an avalanche of destruction. Borne from the absurdity of startup culture, Despair is now a success story in a society where corporate collapse is entertainment (see: The Office, Arrested Development, Enron). But Justin points out that, once again, behind the Despair myth, there’s another company enjoying its own type of success: Amplifier. He notes, “There are a lot of people out there who are chafing as they have to deal with bad fulfillment companies. Now there’s a business operating out of Austin that can facilitate these businesses all around the country. It feels good to know that we’re in an age where people with distinct points of view are able to start succeeding, and here’s a company that helps them to grow faster economically.” Sounds better than Cafepress to me. 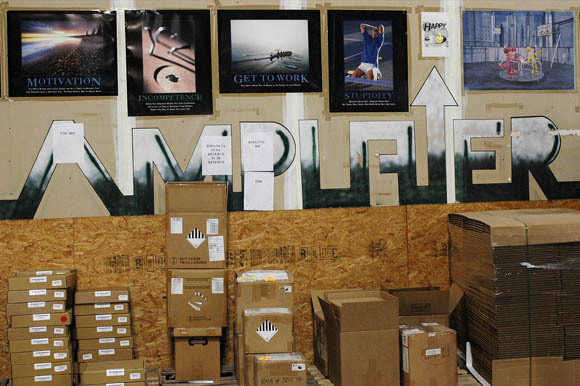 When Justin’s brother, Jef, started Amplifier as a kind of sister company to Despair and took the latter on as its first client, he knew that it could fulfill Despair’s need to customize and personalize orders, to make everything from customer service to shipping part of the experience. Now each of Amplifier’s “Undependents,” as they call their clients, can do the same. And when that list includes Penny Arcade and Rooster Teeth, you know you’re doing something right. Justin brags, “It’s cool that you can build something with a distinct enough value that you can attract companies that you’re fans of.” That whole thing about moving products you’d enjoy yourself, again. Thanks to Amplifier, Despair has successfully broken out of corporate culture to become a pure idea company. With that in mind, the FAQ’s throwaway comment about Dr. Kersten made perfect sense. I never found that sea of cubicles; it was about as real as Despair itself. Thanks to contributor Ben Kharakh for bringing Despair, Inc., to our attention.